This event was originally scheduled for somewhere in Colorado and for some reason it ended up in California at Pomona. I had been wanting to go here anyway. 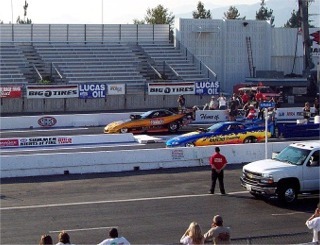 Pomona Drag Strip is a very famous racetrack. One that I remember reading about in my old Hot Rod magazines before I could drive. The event was not well publicized so the turn out was pretty small. The local city also would only allow them to race till 10:00 period. So, at 10:00 they shut it down. The GTX in this picture (the white car) is very similar to one of my favorites at that time also. The Plymouth Road Runner. This looks like about a 1968. AND Spikey if you read this the MOPAR just plain dusted the old Ford off big time. What would you expect. Karen and I talked to one of the owners as he was lighting his grill to make dinner. His car had no sponsor on it so I asked him. He was going it alone this year and hoping to win a sponsor for next year. He, His wife and his young daughter were his pit crew. Wow.. this is an expensive sport to do on your own. Even if you win there is not a lot of money in it. This is why it is billed as Summer Nights of Fire. 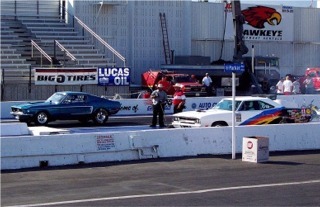 There were alcohol powered funny cars and dragsters. Under the lights you can see flames. Not as big as Nitro Methane power cars but they were OK. 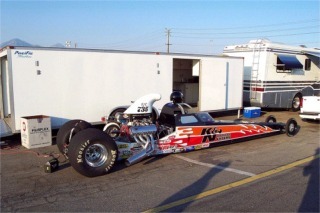 The alcohol power dragsters were running about 5.6 seconds and 260 MPH. 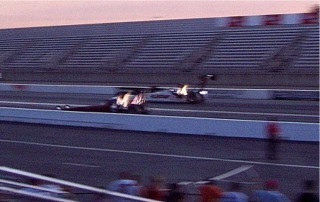 Nitro can break into 4 seconds and top 320 MPH. Same cars just a different fuel. It is also a lot more demanding on the engine components. It is pretty hard to get a good photo of this with a digital camera. They have a pause after you press the button, then the target is moving might fast. So, you have to pan the camera with the subject. All in all this came out pretty good. 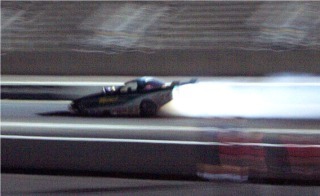 Here is one of the funny cars doing a burn out under the lights. Back in the old days these were called fire bleach burnouts. They would actually use bleach and it would catch fire. The purpose of the burnout is to heat up the tires to give it a better grip on the starting line. I prefer the National events because they will have the Nitro Methane cars. They are just a lot more exciting to watch. But.. hey.. these were OK.